Ever wonder how a pawn shop determines the amount you’ll get for your item? Whether you’re thinking about pawning a small gold ring or a big screen TV, there are several factors that come into play when determining just how much you’ll get for your pawn loan. 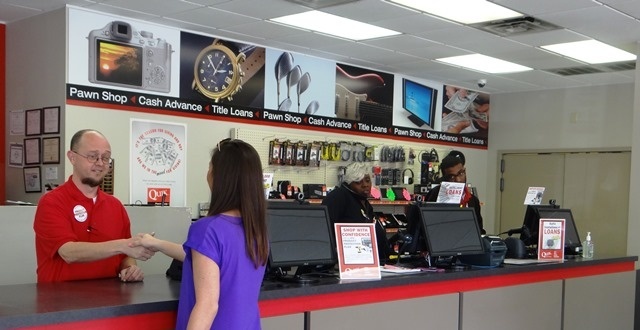 At Quik Pawn Shop, we’ll walk you through our step-by-step process below to help you understand exactly how our process works from the moment you bring in your item to how we decide just how much cash we’ll offer you today! Gold, silver, and platinum are also popular items—which are often purchased, even if in the form of broken jewelry that has little resale value. Similarly, jewelry that contains genuine gemstones has value even if it is broken or missing stones. Quik Pawn Shop pawnbrokers assess an item for its condition and marketability by testing the item and examining it for flaws, scratches or other damage. Another aspect that affects marketability is the supply and demand for the item in the community or region. A customer may offer to pawn an item that is difficult to sell, such as a surfboard in an inland region, or a pair of snowshoes in warm-winter regions. Unless it is easily shipped and can be readily sold online, Quik Pawn Shop must either turn down hard-to-sell items, or offer a lower price to compensate for the higher resale costs. While some items never get outdated (such as jewelry or gold coins), electronics and computer items quickly become obsolete and unsaleable. Quik Pawn Shop pawnbrokers must learn about different makes and models of computers, software, and other electronic equipment, so they can value objects accurately. To assess the value of different items, we use guidebooks (“blue books”), catalogs, Internet search engines, and our own experience. Most of our pawnbrokers are trained in identification of gems and precious metals to assess jewelry. One of the risks of accepting secondhand goods is that the item may be counterfeit. If the item is counterfeit, such as a fake Rolex watch, we will not lend against it. Our company policy is to only sell genuine goods, no fakes or counterfeits. Quik Pawn Shop assumes the risk that an item might have been stolen. Alabama state law requires that the pawnbroker establish positive identification of the borrower through photo identification (such as a driver’s license or government-issued identity document), as well as a 15 business day holding period placed on an item purchased by a pawnbroker (to allow time for local law enforcement authorities to track stolen items). In Alabama, pawnshops must give a list of all newly pawned items and any associated serial number to police, so the police can determine if any of the items have been reported stolen. Many police departments advise burglary or robbery victims to visit local pawnshops to see if they can locate stolen items. Quik Pawn Shop also trains their employees on how to avoid buying stolen property. In addition, although not required by Alabama law, Quik Pawn Shop reports all pawn and purchase transactions to Leads Online, a subscription based service used by law enforcement agencies nationwide to track down stolen merchandise. Once our pawnbroker determines the item is genuine and not likely stolen, and that it is marketable, he/she will offer the customer an amount for it. The customer can either sell the item outright or offer the item as collateral on a loan. HOW MUCH CAN WE REALLY GET FOR YOUR ITEM? To determine the amount of the loan, our pawnbroker needs to take into account several factors. A key factor is the predicted resale value of the item. This is often thought of in terms of a range. The low point is the wholesale value of your item in case Quik Pawn Shop is unable to sell it to our pawnshop customers, and we decide to sell it to a wholesale merchant of used goods. The higher point is the retail sale price if your item gets sold in the pawnshop. IS YOUR ITEM IN HIGH DEMAND? Quik Pawn Shop also takes into account the supply and demand for the item in question to determine if they think they will end up selling the item to a wholesaler at a heavily discounted price or to a pawnshop retail customer. If we believe that the local market for your item is saturated and we will have to unload it to a wholesaler, we will lower the loan amount offered. When calculating the estimated selling price, we have to factor in the overhead costs of the store (rent, electricity, phone connection, advertisement, website costs, staff costs, insurance, alarm system, etc. ), and a profit for the business. ARE YOU LIKELY TO REPAY YOUR PAWN LOAN TO RECLAIM THIS ITEM? In determining the amount of the loan, our pawnbroker also assesses the likelihood that the customer will return to repay the loan and reclaim the item. Since the key to the pawnshop business model is making interest off the loaned money, Quik Pawn Shop wants to accept items that the customer is likely to want to recover, after having paid interest for a period on the loan. If, in an extreme case, a pawnshop only accepted items that customers had no interest in ever reclaiming, it would not make any money from interest, and the store would in effect become a second hand dealer. Determining if the customer is likely to return to reclaim an item is a subjective decision, and the pawnbroker may take many factors into account. For example, if a young man comes into the pawnshop to pawn an engagement ring and tells our staff the wedding is off, then we may doubt that the item will be redeemed. On the other hand, if a middle aged man pawns a top quality set of golf clubs, we may assess it as more credible that he will return for the items. Some customers may attempt to persuade our pawnbroker that the item in question is important to them (“that necklace belonged to my grandmother, so I will certainly return for it”) as a means of obtaining a loan. Other customers return to the same store, repeatedly pawn the same item(s) as a way of borrowing money, and return to pay the interest and recover the item(s) before the end of the loan period; thus, our pawnbroker knows that redemption is likely and will therefore make the loan. The salability of the item and the amount that the customer wants for it are also factored into our pawnbroker’s assessment. If a customer offers a very salable item at a low price, the pawnbroker may accept it even if it is unlikely that the customer will return because Quik Pawn Shop can turn a profit on the item. Think you’re ready to pawn your item? Give us a call at 855-402-PAWN (7296) to get started or click here to find a Quik Pawn Shop near you!